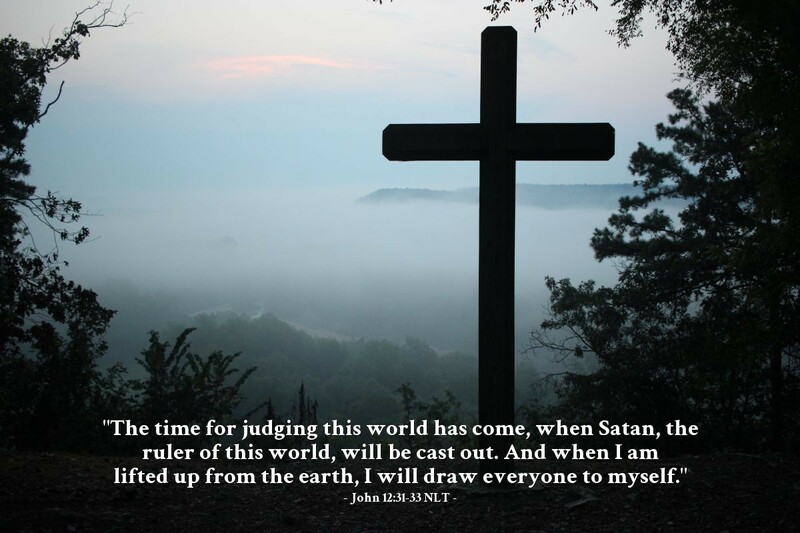 [Jesus said,] "The time for judging this world has come, when Satan, the ruler of this world, will be cast out. And when I am lifted up from the earth, I will draw everyone to myself." He said this to indicate how he was going to die. The cross was the place where the prince of this world, Satan, lost at his own game. Satan had intended to use Jesus' horrible death to destroy God's work. Instead, God used Jesus' death on the cross to be the sacrifice for our sins. Through the resurrection of Jesus, God took away the power of sin and death. The powers of darkness that had controlled the world were defeated at Calvary because of Jesus' obedience to the will of God and his love for us! Father, please give me the courage to live with the confidence that darkness, and the prince of darkness, were defeated because of Jesus' death, burial, and resurrection and that I can now live faithfully for you because of Jesus' victory. In Jesus' name. Amen.